* The Leith Society discussion boards are intended for discussions about the Rules of Golf and the duties and experiences of rules officials. Posts that drift too far from these objectives may be deleted. Limited, good-natured banter, joking and ribbing of participants is allowed, but any post that contains a personal insult or disparagement of another person or organization will be deleted without warning. "Locker room" or "bathroom humor" should be used with discretion, remembering that there are different sensitivities to that sort of material. Posts with excessive use of this type of material will be deleted without warning. * Posts which contain commercial advertising, endorsements, or links to such websites, will be deleted without warning. This rule does not include commercial sites used to illustrate a rules question or answer. * General Discussion: Despite its title, this board is actually intended for questions by "everyday" golfers, not for extended discussions among people experienced in the Rules. A good rule of thumb for this board is that no one experienced in the rules should ever have occasion to initiate a post on this board, and any answers should be limited to the specific question at hand. If you want to expand the discussion, open a new thread on the In Depth page. * In Depth Discussion: Anything goes here, within the general guidelines above. * Referees’ Corner: This board is limited to serious matters that generally concern "real-life" situations encountered by golf rules officials "on the job." A good rule of thumb for this board is that no hypothetical problems should be posted. � *� Feedback Forum:� This board is for any item of general information or interest that is not directly related to the rules, such as problems with the site etc.� It is not a general interest discussion board. Please help us keep the boards to their intended uses. * Any post which contains the name of a golf organization employee or staffer as a source of information concerning the Rules of Golf must contain a statement that the individual's name is used with his permission. Any post without this disclaimer will be deleted without notice. You must not presume you have the permission of the author or golf organization merely because they have provided an answer to your question. Specific permission must be granted. * Any post which contains a message which meets the above criteria and is otherwise acceptable for posting, must contain the full question posed to the golf organization or individual, and the full answer provided. 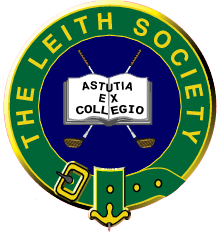 * Any query or statement about the rules of golf made to a golf organization or employee of such organization by any member or participant of the Leith Society boards, shall not refer to the Leith Society in a manner that suggests that the question comes from the Leith Society or that it expresses a consensus of LS members/participants. This is not meant to discourage or control any private communication with a golf organization, but to ensure it is a totally private message instead of a "joint" or "community" message. * Notwithstanding the foregoing, any inquiry to a Ruling Body (R&A or USGA) that arises out of a discussion on a Leith Society board, should state that the question posed has been discussed here and provide a link to the discussion. This allows the RB a fuller understanding of the issues than an inquiry by itself. We recommend the following be inserted at the end of the inquiry: �This issue has been discussed on the Leith Society (name) board.� (Insert link to LS discussion. )Please note: this rule does not relieve you of the above requirements concerning permission to post.